I have recently bought an Apple Mac Mini to play with and my first programming project was to convert the BeebEm emulator program to run on it. I know there is already a Unix port running under X11 which I have also got working on the Mac but this was old source code. Using the current 2.3 Beta 3 build software, I first of all got this working under X11 but a serious shortcoming was lack of image scaling and BBC screen offset adjustment when blitting to the X11 display. This led to convoluted mods to the screen update routines to get it working properly. But it does. However, a native Mac version would be more useful as it wouldn't rely on the X11 server software being installed on the local computer and it would be easier to add menu's and dialog boxes as per the Windows version of BeebEm. I have done the first build of a native version and it is working very well. It is fully playable at 640x512 with 38 fps and 44.1Khz sound (this is on a Mac Mini @ 1.4GHz). The program is still very much work in progress so not all the options of the Windows version of BeebEm are implemented yet. If you are interested in me pursuing the project further, please let me know ! Torch Z80 Co-Processor support with hard disc and TorchNet/Econet. I have also written a games database front end for BeebEm to easily allow you to find the game you want to play and automatically load BeebEm and run the game. More info here. To help create and maintain your emulator disc images, I have also converted my Windows disc explorer programs. Click here to find out more about Mac DFS Explorer. Click here to find out more about Mac ADFS Explorer. 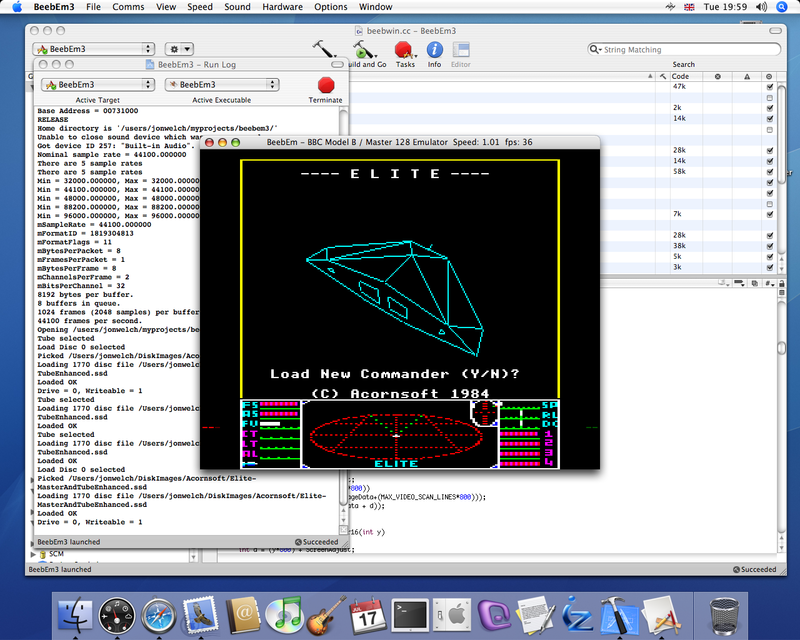 Finally, you can see a screen shot of the emulator running below (click on the picture for a bigger image).